I am about to publish an essay on the body wisdom of sacred hope, rage, and despair. Yup, that’s the time we’re in. One of the things I know is that the InterPlay practice grounds me in hope. 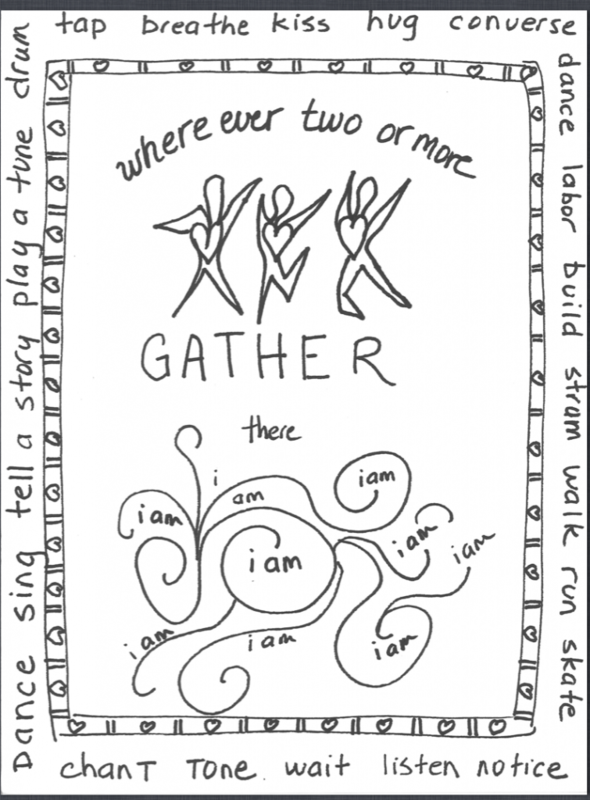 Any time I link body and soul in dance and song in a community I feel like I’ve made it to the lifeboat. Some of us in the online dance chapel are now devotees. “I have been attending Dance Chapel regularly for three to four years and the practice has become deep and profound for me. Although I grew up in a loosely-held Christian household and went on a gargantuan religious quest from 15 to 30, I came up empty handed – no particular faith practice. I consider myself a deeply spiritual person, but I find verbal prayer exceedingly difficult to do. Dance Chapel with Cynthia gives me the freedom to move in prayer in a group body (albeit an online group body). Playing and praying around with my bodyspirit truly unlocks a deeper wisdom – one that thankfully in InterPlay I don’t have to articulate. I can pray at a nonverbal level and experience love at its most simple level – almost molecular. Think of all of us as pure energy – atoms bumping into one another across time and distance – connecting with God and one another. I’m also a visual person. After these dance chapels, during which someone listens to my concern and dances a prayer on my behalf, I take away the image I witnessed of that person’s dance on my behalf and carry it with me into my life. Like a beautiful flower, that image keeps unfolding and blossoming (image a white rose or magnolia). If you would like to attend I can put you on the list for reminders. You’ll get the link and anytime you need a raft, some company, or affectionate prayer in your life, Nancy Pfaltzgraf, Jane Siarny, and I will be there on Mondays at 5pm pst and Thursdays at 9:30 pst.